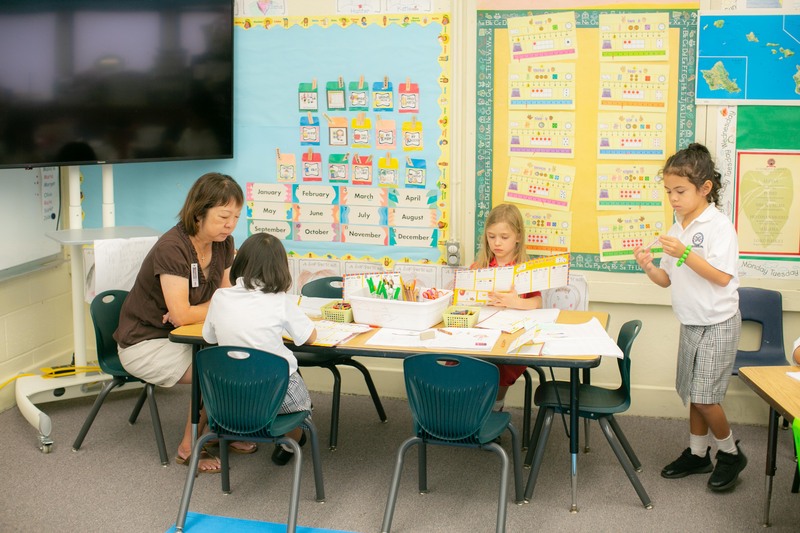 Judy Koseki teaches kindergarten at The Priory at St. Andrew's Schools (SAS). Mrs. Koseki has been teaching for 25 years and has been at The Priory for 21. Prior to joining SAS, Mrs. Koseki held teaching positions at Montessori School of Champaign-Urbana in Illinois; Wilson Elementary; Pearl City Highlands Elementary; and Punahou School. Mrs. Koseki is from East Honolulu and earned her bachelor's in Psychology and Linguistics from Pitzer College in Claremont, California; her master's in Accountancy from University of Illinois; and a Master of Education from Chaminade University. "My mom always wanted me to be a teacher. My way of being defiant was not to do what she wanted me to, so I was off doing other things. As I helped and observed my own children maneuvering through the education process, I became fascinated with pedagogy. I was not thrilled with my career at the time so decided to go back to school to become an educator. My mom was thrilled! I didn't want to ever look back and regret not following my heart." "There are so many things. I love the energy and the joy these little ones have. I love their parents, who are some of the most amazing people I have ever met. I love the incredible growth I see in the children in all areas in just one year. I especially love the children's gifts of notes and drawings, and the look on their faces as they present them to me, as if to say, 'Look what I did for you! Isn't it great?' It always is!" "I have taught kindergarten since I've been here. It wasn't planned, but I've always been in primary classrooms." "Have you seen my room? Kindergarten teachers never throw anything out! I'm desperately trying to find the Marie Kondo side of me! I justify it by my passion for sustainability. You just never know when you need those tofu containers or that 10-year-old box of odds and ends ribbons." "I get to come to school to teach in an exciting, warm, engaging and dynamic environment. My colleagues, students and parents help me to continue to learn and grow as a teacher and a person." "My students have been my greatest inspiration. It's amazing what life lessons can be learned from 5- and 6-year-olds." "I believe in the Law of Attraction and that visualizing is the secret of success and that your thoughts become things. One of my favorite authors is Rhonda Byrne. In 'The Secret,' she wrote, 'It is impossible to bring more into your life if you are feeling ungrateful about what you have. Practice gratitude.'" "I want them to truly understand what having a growth mindset means, to not be afraid of making mistakes but to learn from them, to fill their own buckets and those of others, to enjoy the ride of being learners, and may that road never end. Ultimately, I want them to discover their passions and follow those dreams and to be good people in every sense of the word." "For many years, I yearned to go to veterinary school. I was cured of that desire when I went into a barn on the campus of the University of Wisconsin to visit a cow that was being used for research. Because it was winter and cold, the doors and windows were shut. I think I literally turned green from the odors! Now I'm happy in what I do." "I love organic cooking and am constantly trying out new recipes. I became interested in eating organic more than 30 years ago when finding organic foods and products was very difficult. I also love spending time with my two grandchildren who bring us so much joy." "We have lived in California, Wisconsin, Tokyo, and Illinois – which is where all three of my children were born. At the time, my husband Aaron, was a professor in Religious Studies. He always talked about going back to school to study some form of therapy. When our first child was born prematurely and suffered from Hyaline Membrane Disease (what President Kennedy's son died from), he did just that and became a respiratory therapist. He is now a professor in Allied Health at Kapiolani Community College. We have two other therapists in our family. My first son, Aaron 'Ken' is a speech therapist, while my second son, Jacob, is a music therapist, treating adults and children experiencing health or emotional issues through music. He has also been a volunteer using music therapy to help pediatric cancer patients and babies in the neonatal unit. Our daughter, Hannah, was a Teach for America educator and taught science at Waianae High School for three years. She is now an attorney in New York City. "Although we have had every pet imaginable in our household, we are clearly dog lovers. Sadly, the Year of the Dog was not good to our dogs, as we lost two this past year. It was incredibly painful! We do still have a Norwich Terrier named Dash, who is enjoying more attention. He's lonely, though, without his pals, and we have to leave a radio on for him when we leave for work."